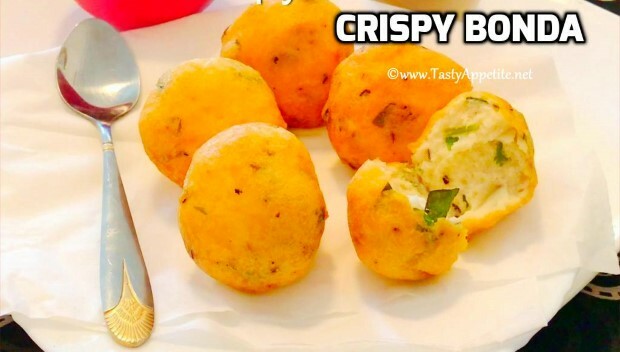 Crispy Bonda is a very popular tea time snack from South Indian cuisine which is loved by all over India! This easy snacks is made from urad dal. The process of making bonda involves deep frying the fluffy urad dal batter mixed with flavorful spices and deep fried in hot oil. The combo of hot crispy bondas along with filter coffee / masala chai is unbeatable. I love to enjoy this crispy snack when its raining outside during monsoon season. It tastes soft chewy inside with crisp n golden texture outside. Here's the easy recipe! Wash & soak urad dal in water for 2 hours. Add urad dal to blender. Add salt and grind to coarse batter. Sprinkle few tsps of water and grind to thick smooth batter. The batter consistency should be thick as shown in video. Add rice flour, sliced green chilli, grated ginger, coconut bits, finely chopped coriander and curry leaves, crushed pepper, hing and mix well. Wet your hands with water and take a small ball of batter. Fry 4 to 5 bondas at a time. Deep fry in medium flame until the bondas are cooked golden and crispy. Crispy delicious restaurant style bondas are ready. Enjoy hot with coconut chutney, sambar or any side of your choice.